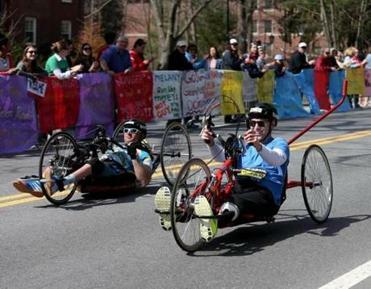 Handcyclists took off from Hopkinton during the 2013 Marathon. The head of the group that organizes the Boston Marathon apologized on Tuesday for comments that offended some wounded veterans and bombing survivors who compete in the race’s handcycle division, and pledged changes that would make the race more welcoming to athletes with disabilities. The apology follows two columns in the Globe last week, including one penned by Marathon bombing survivor Patrick Downes, that took the BAA to task for giving handcyclists short shrift on Marathon day. The division’s winners are not celebrated with wreaths and announcements, as those who run or use wheelchairs are. And this year’s inclusion of 30 handcyclists, the largest field ever, still does not meet demand. Handcycles are powered by riders’ arms, allowing racers with certain disabilities to pilot the three-wheeled vehicles effectively. The handcycle field at the Marathon is open mostly to wounded veterans and survivors of the 2013 attack, with some slots open to civilians with disabilities. Restrictions have prevented dozens of wounded warriors and civilians with disabilities from participating in the Boston Marathon. “It means so much to us that this is being recognized as a serious issue,” said Downes, who lost a leg in the Marathon bombings andwill compete using a handcycle for the third time on Monday and the fifth time overall. 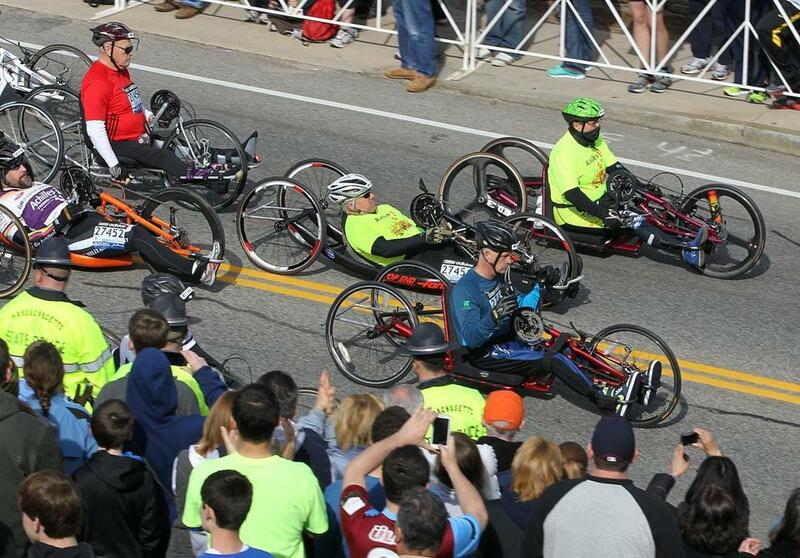 Downes said the changes planned, but not yet announced, would begin to position the Boston Marathon as a “world leader in accepting people with disabilities.” A BAA spokesman said more details would be available Wednesday. Other marathons have been more welcoming to handcyclists, Downes said. But Boston changed after the bombings, and became “a symbol of triumph and resilience.” If any marathon should welcome athletes with disabilities, it’s this one, he said. “You’d think you’d do anything not only to accommodate those people, but to embrace the whole family” of people competing with disabilities, said Janet Patton, director of the Achilles Freedom Team of Wounded Veterans, which represents athletes competing in marathons all over the country. Patton said she and Downes spoke with the BAA by phone last week and on Monday, and called Tuesday’s apology a great start. She said the BAA would allow the wounded warriors to take their own bus and equipment truck to the starting line in Hopkinton, relieving them of the burden of having to board BAA buses with other runners, often without their prostheses. Patton will also be allowed to retrieve competitor bibs for the disabled athletes at the Hynes Convention Center, where they previously had to maneuver their wheelchairs and/or service dogs in a chaotic scene. “We definitely have been heard,” Patton said. Downes said he was particularly excited to see those he’s competed with Monday — including veterans wounded in war who became handcycle athletes, like Army veteran and triple amputee Adam Keys, and Army veteran Tom Davis, who became one of the best handcyclists in the world after injuries in Iraq caused his leg to be amputated above the knee. Davis was a runner growing up and during college, and he dreamed of the Boston Marathon. In 2013, he won the handcycle division before the bombs went off. “I came back the following year and did it again, and it all took on a lot more meaning,” Davis said. He said he was excited about changes to make the marathon more welcoming. “Actions speak a lot louder than words,” Davis said. Downes credited both the awareness raised by the Globe articles and political pressure with affecting change. Last week, state Representative Dan Cullinane of Dorchester sent the BAA a letter, co-signed by 71 state legislators and seven Boston city councilors, demanding concessions and better treatment of handcyclists. Kevin Cullen of the Globe staff contributed to this report. Nestor Ramos can be reached at nestor.ramos@globe.com. Follow him on Twitter @NestorARamos.